Lorraine Prince, of the Newton Creek Watershed Association, has lived near the Collingswood portion of Newton Lake for decades. She and others are concerned about whether Camden County’s proposed dredging project also will address the causes of sedimentation problems plaguing the lake. A popular spot for walkers like me, as well as for anglers, kayakers, canoers, cyclists, and wild critters of all kinds, Camden County's Newton Lake Park nevertheless needs some special attention. Erosion, sedimentation, and eutrophication — the latter an oxygen-depletion process fed by goose poop, fertilizer, and other sources of nitrogen and phosphorus — collectively have lowered water levels and water quality. All of this has encouraged warm-weather algae blooms and the proliferation of other invasive or nuisance plants that can give the otherwise lovely lake a saladlike appearance and a pea-soup hue. So the county has decided to spend from $20 million to $30 million to dredge the 2.5-mile-long lake portion of the Newton Creek between Cuthbert Boulevard in Haddon Township and the Black Horse Pike in Oaklyn. The work will be funded by a 30-year, low-interest state loan, is expected to begin next fall, and should be completed within 18 months to two years. "It will be the largest, most expensive capital project in county park history," says Freeholder Jeff Nash. It may also be a contentious project, given that thousands of Collingswood, Haddon Township, Oaklyn, and Audubon Park residents live on or near Newton Lake. Countless others visit the park for recreation. "We're glad the county is paying attention to Newton Creek, but it all depends on what they're going to do," says Collingswood resident Lorraine Prince, of the Newton Creek Watershed Association. "We're waiting to see the latest plans." The county does have quite a few questions to answer and constituencies to satisfy. How will the dredge spoils be dealt with? What will the spoils contain? What about the impact of the work on wildlife? On people? Samples of sediment are being taken in advance of the work, at the direction of the state. "The results are so far, so good. The sampling is continuing," says Andrew Kricun, executive director of the Camden County Municipal Utilities Authority (CCMUA). Says Haddon Township resident Fred Stine, citizen action coordinator of the Delaware Riverkeeper Network: "My first concern is the method of dredging and dewatering the spoils. The second is how aggressive the county will be to prevent new sediment from flowing in." A photograph taken for a Camden County Parks publication in the 1930s shows what Newton Lake looked like prior to improvements. Sedimentation is causing similar conditions in parts of the lake in recent years. While some environmentalists might dream of allowing the man-made lake — the dam is at the Black Horse Pike — to revert to the marshland it once was (and keeps trying to become), some of the lake's neighbors might prefer to get rid of the riparian buffers surrounding the water, so they can enjoy the view again. 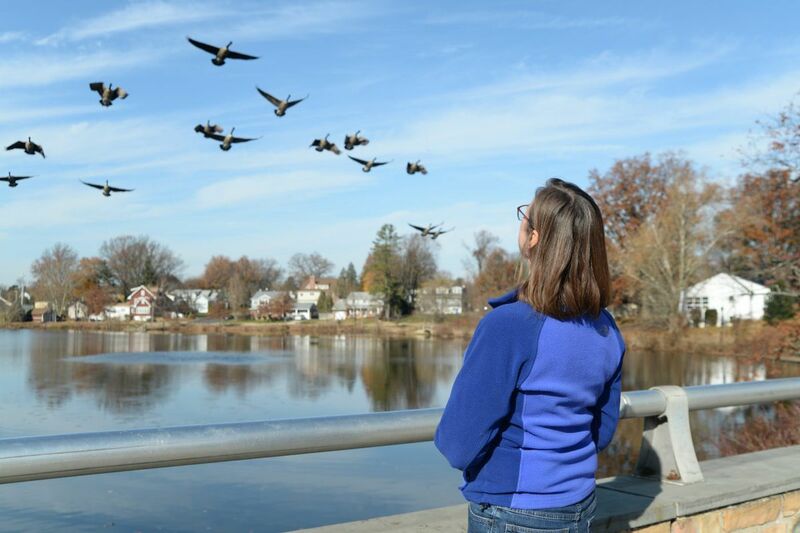 "Those of us who live on the lake wonder whether we're going to be looking at orange fences and piles of muck," says Patt Osborne, a Haddon Township resident and outdoorswoman who uses the park daily and appreciates the water-management function of the buffers. "But my biggest concern is that the work be done in a way that is helpful to the community, and environmentally sound." While the dredging will be the most visible and dramatic component, stabilizing the shoreline to combat erosion, and managing or eliminating upstream sources of sediment, are essential to the success of the project. Says Nash: "We don't want to be back dredging again in 10 years." Lorraine Prince, who is a leader of the Newton Creek Watershed Association, says upstream sources of sedimentation must be addressed as part of a planned dredging project. The upper portion of the lake, between Cuthbert and the Lees Lane bridge in Collingswood, was dredged in the early 1970s and again about 15 years ago. A sediment-containment system constructed as part of the second dredging project would help if it were properly maintained, says Stine; the amount of muck flowing into the lake from upstream is 1,371 tons annually, according to a report prepared for the CCMUA in 2016. Although a subsequent engineering analysis concluded that erosion along the shoreline of the lake itself is the worst source of sedimentation, it affirmed the earlier study's finding that a stormwater outfall pipe serving the Paul VI High School campus in Haddon Township also is a significant factor. The pipe discharges directly into the headwaters of the main stem of the creek, which winds through a muddy ravine deep within nearby Saddler's Woods. The county has had discussions with the Diocese of Camden, which owns the high school, about how to address the situation. I couldn't reach a diocesan spokesman for a comment, but Kricun says the talks have been positive. The county also has begun reaching out to the organizations such as the Riverkeepers, the Watershed Association, and fishing groups; after all, anglers have a unique perspective on a body of water like Newton Lake. "It's an excellent fishery," says lifelong angler Rashawn Lewis, of Winslow Township. "My club, South Jersey Hook This, had our 2017 Bass Classic there this past September," adds Lewis, who's fished Newton Lake for 20 years. Adam Mihara, a fisherman from Marlton who, like Lewis, has attended meetings about the dredging project, says he typically finds "large-mouthed bass, crappie, yellow perch, catfish, carp" and an abundance of other species in the Newton's waters. The two anglers are passionate about Newton Lake, as is pretty much everyone else I talked to for this column. Prince meets me for an interview with her boots on, ready to stand in the water if necessary; Osborne often kayaks through what she calls "the gorgeous environment" of the Newton. Says Kricun: "It's a jewel of the county park system." And it deserves to be treated accordingly.